Posted on May 19, 2015 by nathanlostlighthouse	in Uncategorized and tagged board game, board games, board gaming, cthulhu, Cthulhu mythos, Cthulhu Wars, Elder Sign, gaming, Great Ones, H.P. Lovecraft, Kickstarter, Literature, Nyarlathotep, Sandy Petersen, Sci-Fi, The Lost Lighthouse, TLL, tllgaming. You’ve probably never heard of this game, and if you have then I imagine you are keen to play. I have played once and been a spectator once for this game and even though to begin with I found it very confusing, it was a hell of a lot of fun. 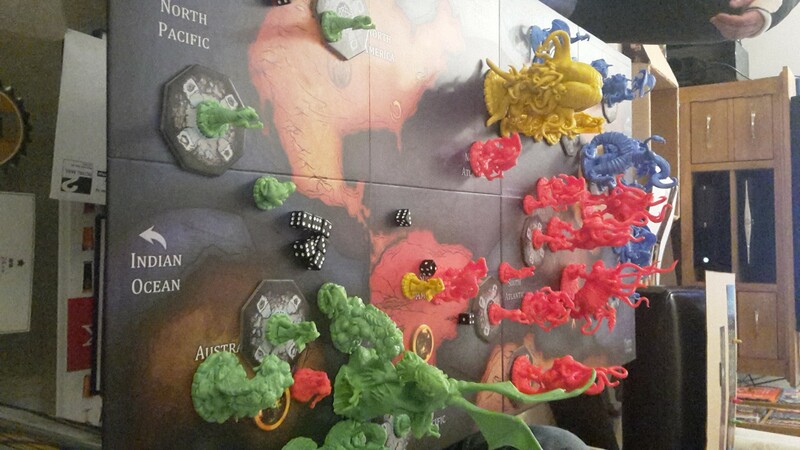 Cthulhu Wars is a strategy board game where the aim of the game is to have your faction destroy the world. Sounds simple, however each faction is completely different from one another, with different gods or Great Ones, as well as minions with different abilities and spells. It means that any situation is possible with numerous different outcomes. The game is developed by Sandy Petersen, a former game designer responsible for titles such as Doom, Doom 2, Quake and Age of Empires. A very impressive CV. Sandy is a fan of H.P. Lovecraft’s work, The Call of Cthulhu, and after an extremely successful Kickstarter campaign (where 1.4 million dollars, 3,500% of the initial target was raised) Cthulhu Wars was developed. I am ashamed to say that I didn’t add anything to the Kickstarter, but one of my close friends did and received the core game once it had been produced. I was lucky enough to be a player in the inaugural game. That is a basic introduction. Each faction will have different strategies that will allow them to acquire doom points and power in various different ways. The Great Cthulhu and his faction are powerful and very attack minded with some brilliant actions available in his arsenal. He uses a lot of power to summon the first time, but then he can go in all guns blazing as he is cheap afterwards. His abilities include Submerge which allows Cthulhu and his army to sink into any ocean and appear anywhere on the map. This can be extremely devastating and can ruin anyone’s strategy in one simple move. The crawling chaos are a very opportunistic faction, picking their moments carefully in order to become extremely powerful late in the game. If left alone, they can take control very quickly. The great old one in this faction is Nyarlathotep, a strange character but very powerful. One of his abilities is A Thousand Forms. This allows the player to roll the dice and whatever it lands on either the player gains that much power or the other players must share a loss amongst themselves. If it isn’t decided within a minute, the player gains the power. This can really turn the tide in the battle using this addition towards the end of your turn, especially if you need to obtain a gate or summon some extra monsters quickly. 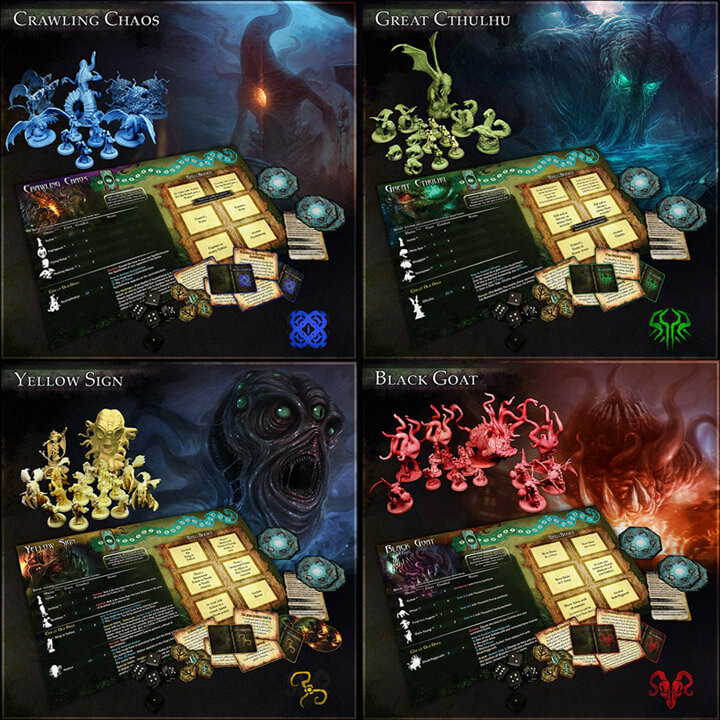 Yellow sign are an interesting faction that require strange stipulations in order to obtain the spellbooks. They do benefit from 2 elder ones, the King in Yellow and Hastur. The King in Yellow is a bit more powerful than the usual monsters, but not as powerful as the other great old ones. Hastur however is brilliant, he is a giant head and can enforce some ridiculous powers. One is called He Who Must Not Be Named. This allows Hastur to teleport anywhere on the map and perform a second action immediately. Twinned with the Screaming Dead, which allows The King in Yellow and his army into the same area, this means can you wipe out any army in one quick turn. This faction is quick out of the blocks and you have to keep it that way. The player must get the army out quickly and prevent the other factions from getting a foothold in the game. The great one is Shub-Niggurath or the Black Goat. Cheap to summon and he makes it easier to summon the rest of the the army. One ability is The Thousand Young. This allows your monster to be summoned for 1 less power. It means you can summon your army very quickly and cheaply in order to gain a hold. No power is the same in any faction, however you have to play to all the strengths and weaknesses of each faction in order to win the game. The board from the first game. Guess which faction won? Answer at the end. The game starts off with everyone having an equal amount of power and no matter what, Cthulhu goes first. There is no dice roll for whoever goes 2nd, the player who is first chooses if the game goes clockwise or anti-clockwise. The players place all their cultists in their home territory and then take turns in moving and building gates (pretty much all you do first turn). In this game I was the Crawling Chaos (blue) with Nyarlathotep as my great one, with my special ability of Fly, which allows me to travel through 2 realms instead of 1 if I choose to. The second round is when summoning and spellbooks come into play a bit more with everyone trying to choose between gaining spellbooks in order to have powerful spells at there disposal, or summon monsters to increase their army on the board, to protect their cultists or kill enemy cultists. If a monster moves on to an enemy cultist’s area, the cultist is defenceless and can be abducted by the other player. If that cultist is protected by a monster, then an invading monster will have to battle the other monster to kill it. It is worth noting that enemy players can share a territory. The Black Goat has a spellbook stipulation where they need to share a territory with all of the other factions at once. By round three, everyone had summoned their great ones and the game board started to get filled with monsters. Each monster has it’s own spellbook assigned to them. I had some monsters called Nightgaunts and with their card, I could abduct enemy monsters without fighting them. This was very useful in certain situations as it allowed me to move into areas with ease. As the game wore on, I realised that I needed to move and attack gates quickly in order to increase my power and doom points. Luckily, with the fly ability, I was able to move around the board quickly and get a foothold on a few gates. It turns outs that Nyarlathotep comes into the game later than the rest and if left alone, he can win without much trouble. Also we were all pretty conservative throughout the game so as Nyarlathotep wasn’t stopped earlier, it was smooth sailing from there. 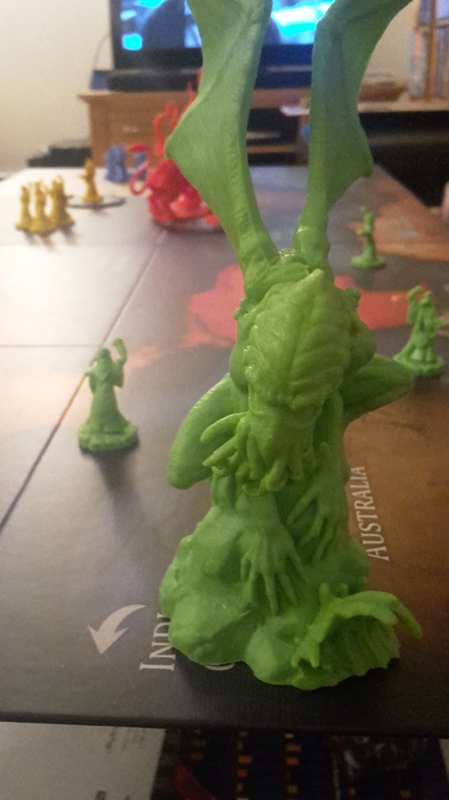 I won the first game of Cthulhu Wars and had a lot of fun playing. The second game was a 4 player game, where all factions were involved. 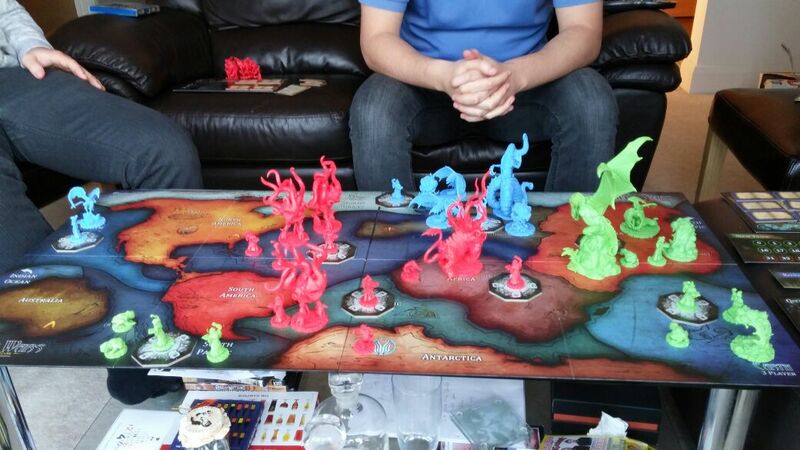 Again the same thing happened in this game, Nyarlathotep wasn’t stopped early enough and won the game. I was told by the owner in the game that in the tutorial videos that Nyarlathotep never wins. It means that the game needs to be more cut throat instead of conservative. Some factions need to go in all guns blazing, others need to pick their opportunities and others need to stay out of the way until they reach their full potential. Also in the making are some new factions as well which can be used in the 5 player game board. There are also talks to increase the game board further. The Wind Walker, The Sleeper and The Opener of The Way are the newest factions being developed with their own abilities and rules. There are neutral factions coming into play as well, where the first team to summon the faction gains them in battle. I think it is safe to say that this new game will be around for a very long time and I cannot wait until the new factions and new boards to come out in order to continue playing this game. Overall I rate this game 9 out of 10 devoured minions. A new classic that will be around for many years and I sincerely hope everyone gets a chance to play it.